One of the visions for the 2025 plan since its inception was to transform Nicollet into a must-see destination. This year, the new Nicollet is showing how important it is to the vibrancy of our city’s core. Nicollet underwent a $50 million renovation that completely transformed its look and how our downtown community interacts with the space. This public-private partnership helped bring the City of Minneapolis and the business community together to produce a newly renovated Nicollet for all to enjoy. Because of how it is impacting downtown Minneapolis, the Nicollet Project was selected as one of this year’s 2025 plan leadership award winners. It will be recognized on October 2 at the mpls downtown council annual gala. Known as one of the key “triple spine” corridors of our downtown—with Hennepin Avenue and 1st Avenue being the others—Nicollet welcomes approximately 130,000 people daily who either work in adjacent office buildings, frequent its restaurants, stop in its stores, or act as a thoroughfare for visitors heading to another downtown destination. But now, it does so much more. Nicollet’s renovation has facilitated a space where all who live, work, play and explore downtown can enjoy new and exciting features that are at work throughout the year. As part of the renovation, Nicollet now boasts the second largest collection of public art in the city—trailing only the Minneapolis Sculpture Garden. Along Nicollet, you’ll see the refurbished Nicollet Sculpture Clock, Ned Kahn’s Prairie Tree, Blessing Hancock’s Nicollet Lanterns, 92 artist-designed manhole covers, shadow of spirits art, the Light Walk armature and more. Plus, this fall you’ll see Tristan Al-Haddad’s Numbus added near the Minneapolis Central Library. More than 250 trees were planted along Nicollet, adding more green space between Washington Avenue and Grant Street. In addition, more than 1,500 programmable LED lights are all along Nicollet adding to the vibrancy. All of these Nicollet enhancements provide the infrastructure for new programming and activities along Nicollet throughout the year. This year alone, Super Bowl Live brought Nicollet to life during the Super Bowl LII celebration—adding music and entertainment all along Nicollet. In May, Nicollet hosted a Springtacular event between 9th and 10th streets that featured live music, food, games and more. In July, the Minnesota Twins hosted Mall Ball, a whiffle ball home run derby between 7th and 8th streets. And in September, Target Corporation held a Block Party between 10th and 11th streets during their annual conference—welcoming a sea of red along with the general public to take part. 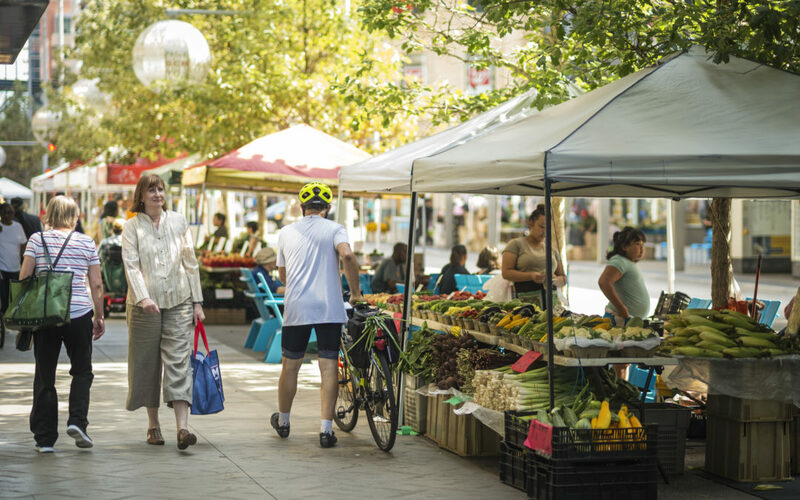 Each Thursday, the Minneapolis Farmers Market returned to Nicollet and provided fresh local produce and products. Plus, the Mpls Downtown Improvement District is leading activation on Nicollet throughout the year through the On Nicollet programming. The DID’s programming schedule in 2018 included the Nicollet Makers Market, Street Show musical performances, live performances at the Nicollet Theater in the Round, outdoor fitness with the YMCA of Minneapolis, games at the DID Pop-Up Satellite Office, Street Eats food cart roundups and more.